Business applications based on block chain technology are dramatically changing the way data is stored and retrieved. Successful companies today throw traditional, rigid cooperation processes overboard and cooperate in flexible alliances with shared use of available resources. Thus, Block chain has a real and very large meaning for all business models still needing the services of a central mediator today. Our goal is to show companies ways to use the advantages of an own block chain ecosystem with Smart Contracts and to accompany them through the implementation and expansion of decentralized applications on these. One of the strongest arguments for the Blockchain technology is the high degree of transparency combined with unchangeability and revision security of the data. The sovereignty of the data always remains with the owner. Blockchain technology thus eliminates a central switching instance that can read the data exchange and store the data in its own system according to its own specifications. The transactions can be executed directly between two or more – even unknown – parties. A smart contract takes on the role of the mediator, the trustworthy authority, which determines the rules of the game. Executed as a distributed app, interaction with the smart contract is possible from anywhere and does not require a provider’s central cloud platform, as transaction data is stored directly in the block chain in encrypted form. 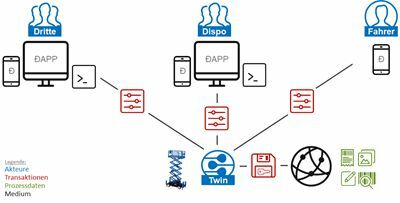 The Decentralized Business Communication Protocol, or dbcp for short, is a communication protocol in the interaction space of decentralized, open ecosystems. The protocol was developed as part of a collaborative research project funded by the Thuringian Ministry of Economics, Science and the Digital Society. Besides Join GmbH, LINDIG Fördertechnik GmbH, Fraunhofer Institut für Digitale Medientechnologie (IDMT), Duale Hochschule Gera-Eisenach (DHGE) and Ernst-Abbe-Hochschule Jena (EAH) were involved in the research project. Once the protocol has been developed and tested as part of the research project, it is available to every company. Is block chain suitable for your application? Test your technological and product ideas in our Join Lab! Test your ideas and check their suitability. Available at three locations in Germany: Magdeburg, Eisenach, DresdenIn a Discovery Workshop we get to know your problem and outline solutions with you. A well-rehearsed team with a high level of process knowledge and the necessary start-up drive starts with a lean development process. Depending on your own availability, you can become part of the team to accompany the technical implementation, uncover unknown potentials immediately, determine interfaces to surrounding systems, and test user experience. Through decentralized, cross-company process digitization using block chain, process-relevant data can be efficiently exchanged. evan.network is an open blockchain ecosystem on which every company can quickly and securely build its own business models and projects. It provides the basis for secure data exchange in flexible corporate partnerships without losing control over your own data. The evan.network is operated and further developed as a consortium blockchain by the participating companies and therefore it has a truly decentralized architecture, unlike many private chain solutions.